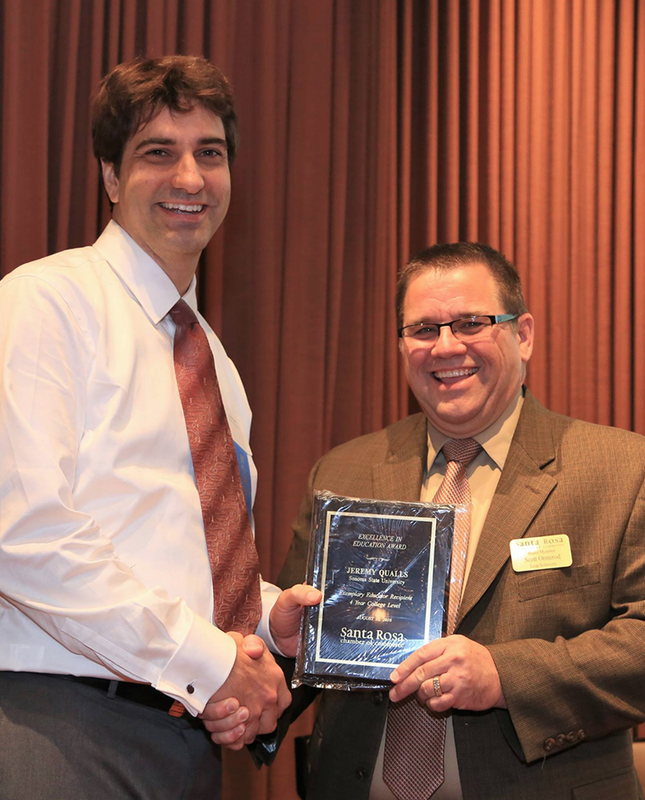 Sonoma State University Physics Professor Jeremy Qualls has received the Santa Rosa Chamber of Commerce Excellence in Education Award. He was honored along with a handful of educators in categories from pre-school to four-year college at the Chamber's Education and Business Partnership Breakfast this week. "It was very surreal when I heard my name called," says Qualls, who knew he was nominated but did not know he would be receiving the award. "I was very proud to be recognized for my work especially in promoting STEM education. Receiving this award while being surrounded and supported by my peers and friends was definitely a milestone event in my teaching career." The Chamber was impressed with his creation of new and innovative programs, like the immersive, yearlong First Year Experience "A Watershed Year" and the maker course "Dream, Make, and Innovate." Over the past five years, Qualls has received significant funding from The National Science Foundation to explore pathways to increase student interest and retention in STEM subjects at Sonoma State. Qualls teaches a number of other popular classes at SSU including The Physics of Toys, in which students investigated physics through the lens of toys like Nerf guns and Beyblades. This year, he is offering a new course, the Physics of Martial Arts, developed in tandem with Philosophy Professor John Sullins' new course, the Philosophy of Martial Arts. "There is so much physics underlying martial arts, and it's a great way to engage the students," says Qualls, who has many years of experience in mixed martial arts. Prior to joining Sonoma State in 2007, Qualls taught at Wake Forest University and the University of Texas. When he's not working with undergraduate students on his research projects involving organic superconductors or harvesting water from air, Qualls is also an avid fencer.